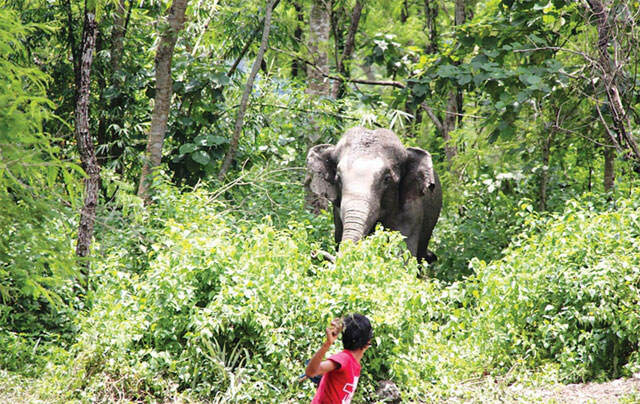 DO'S AND DONT'S: Elephant conservationists say trying to frighten migrating elephants like this villager in eastern Nepal can make them angrier and more destructive. Conservationists are testing early warning devices to reduce damage from increasing conflict between people and wild elephants in Nepal and other parts of South Asia. As human settlements encroach on traditional routes for elephant migration, fiercely protective adult elephants demolish buildings, overturn cars and gore farmers who have tried to chase them away. In Nepal, 18 people were killed in 27 wild elephant attacks in 2016 alone and two elephants were killed by villagers in retaliation. India saw more than 400 people and 100 elephants killed in wildlife encounters, and in Sri Lanka 88 people and 279 elephants were killed in the same year. A photograph last year of an elephant and calf being torched with tar balls in India won awards and drew international attention to the hostility the pachyderms face near human settlements. While such conflict cannot be completely eradicated, they can be reduced. Now, conservationists in Nepal are exploring both traditional and modern knowledge to devise conflict-prevention and mitigation strategies. 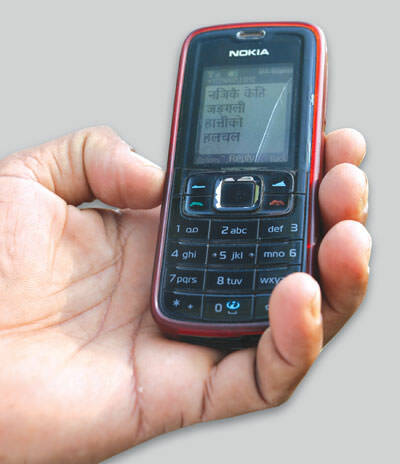 Particularly, experience with smart Early Warning Systems (EWS) that employ motion detectors and automatic dissemination through mobile SMS that have saved many lives in Bardia, can be shared with neighbouring countries. 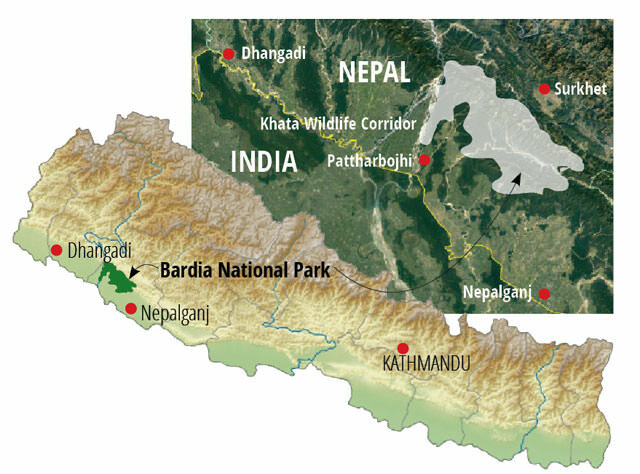 Bardia National Park and WWF Nepal collaborated with Engineering Adda Nepal to test the warning system in Pattharbojhi village between January-June 2017. Located within Khata Wildlife Corridor connecting Bardia National Park with Katerniaghat Wildlife Sanctuary in India, the village faces frequent and intense conflicts with elephants. Two people were killed and 19 houses destroyed by elephants in 2016 here. Strategically placed hybrid sensors using a combination of acoustic and seismic signals detect elephant movement, automatically setting off a siren, and sending SMS alerts to selected phone numbers in the vicinity. The sensors were tested on captive elephants to record data on sound and motion associated with elephant movement, and this was integrated into an algorithm to accurately identify elephants and remove false positives. Pattharbojhi village that lies on the path wild elephants regularly take need a longer-term solution than just early warning. For the trial, sensors were placed at 5 metre intervals in the periphery of Pattharbojhi village with its known entry points for elephants. During the six months last year, some 21 instances of attempted entry of elephants were identified. The EWS had a 82% success rate in sounding siren alarms, and sending SMS alerts worked 70% of the time. A review of the cases showed two main causes for missed alarms: the siren system was compromised due to rats chewing up the wires, while SMS alerts were halted by service provider after the pre-paid amount was consumed. The team is working to resolve these issues by upgrading the wi-fi mechanism, and is on a deal with the telecom service provider. The next trial will be conducted in the Bardia National Park buffer zone by extending the detection range so that there will be more warning time. The team will also document the behavioural response of elephants in order to further improve the system. The EWS can save lives by warning of elephants in the vicinity, however, it cannot address the root of human-elephant conflict which is related to habitat encroachment and public awareness. Complexities on ground mean that a combination of responses needs to be customised to specific locales. Immediate short-term solutions will include people being made aware of dealing with elephants in the right manner, and accepting that there may never be a permanent solution. Actions such as setting off firecrackers and rattling pots, installing fences have been used to prevent physical encounters with elephants – they sometimes work, but at other times make them react even more angrily. Elephants are highly intelligent beings, with incredible memory and learning instincts. They need a wide range and enormous resources in - food, water and space, for survival. If they need to eat, they will find food. If they need to move, they will find a way. Conservationists are trying to find long-term solutions like alternatives to crops that wild elephants prefer, or even granting elephants their traditional right of way. Ultimately we have to fall back on human understanding and empathy for the sentience of these animals. But even so, given demographic pressures on the wilds along the India-Nepal border, our solutions may at best be temporary. Increasingly, scientists are finding how animals adapt to human-modified environments. We may just have to return the favour by adapting to their presence. With inputs from Kanchan Thapa and Sabita Malla of WWF Nepal. 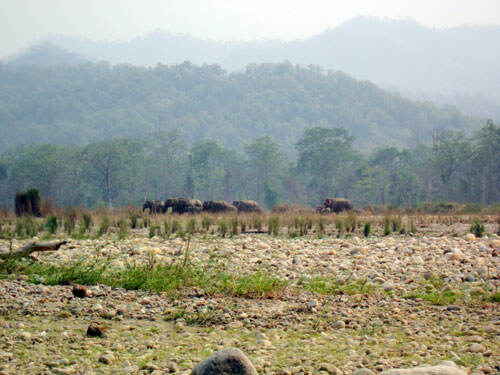 Migration paths like the Babai River (above) or the Khata Wildlife Corridor are frequented by wild elephants and are near human habitation. 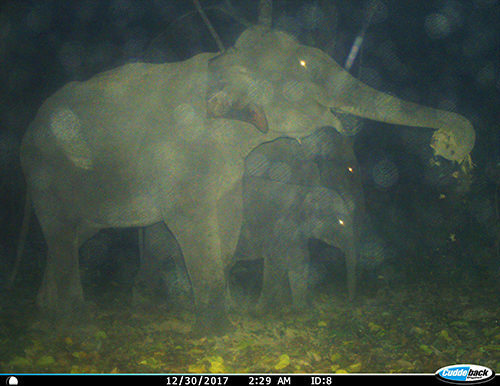 Camera trap image of wild elephant in Khata Wildlife Corridor. Geophone motion sensors are placed at strategic locations where elephants roam. 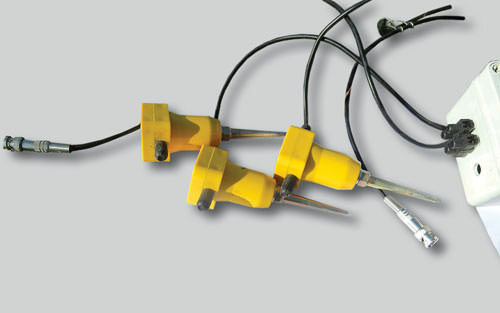 These devices analyse the frequency of vibrations to filter out non-elephant activity. When positively identified as wild elephant movement, the information is transmitted via the telecom system as SMS to selected phones in the vicinity, or via social media groups. 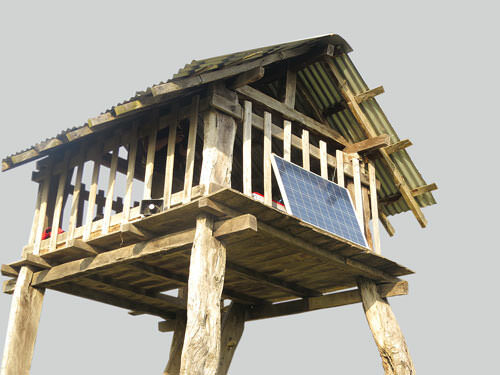 The SMS also trigger alarms on solar-powered sirens on watch towers near villages. Kavre is suffering a drought in the middle of the monsoon, is this a result of climate change?